For more information, contact Ted Knight at teknight@umd.edu. 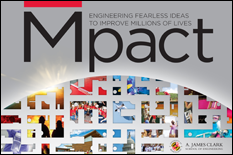 The University of Maryland?s A. James Clark School of Engineering is a premier program, ranked among the top 20 in the world. Located just a few miles from Washington, D.C., the Clark School is at the center of a constellation of high-tech companies and federal laboratories, offering students and faculty access to unique professional opportunities. Our broad spectrum of academic programs, including the world?s only accredited undergraduate fire protection engineering program, is complemented by a vibrant entrepreneurial ecosystem, early hands-on educational experiences, and participation in national and international competitions.